The Children’s Playground in the Cambridge Domain was established in 1919 on the site of a former stop over pa used by the Maori on their way from Pirongia to Maungakawa. King Tawhaio called Lake Te Koutu – Te Okohoroi ‘the wash basin’. A Nice Little Farm of four acres, within one mile of the Post Office could be had for £1000, or 11 acres with a good six roomed kauri house for £1950. A seven roomed house within three minutes of the station and Post Office, hot and cold water, all conveniences – £1500. A 473 acre farm, nine miles from Cambridge was going for £24 an acre. An acre of land in town was £300. The Te Miro farmers did not feel so affluent. Mr Bamforth, in a talk to the Cambridge Historical Society in 1958, recalled that “he lived in a tent for three months before building a two roomed shack”. In 1918 their only access, the clay road from the sanatorium, was ankle deep in mud. Cartage was £2 10s per ton and at one time it took a laden dray drawn by four horses, three days to cover four miles. Contracts had been let for the lower road but it was done in winter and consequently turned into a quagmire. The settlers had wanted the top road done first. A report in the Independent September 1919 stated “the road formed over the swamp is utterly impassable for vehicular traffic and we have to depend on the courtesy of our neighbours for an exit at present”. Other setbacks to their farming venture were rabbits, deer and pigs which ruined their crops. It was not until the Maungakawa Rabbit Board was formed in 1920 that it was possible to start farming economically. A number of the soldier farmers (there were 22 petitioners for a Rabbit Board) were determined to battle on and made remarkable progress in spite of predictions that the settlement was doomed to failure. Mrs Mary Payne nee Bradshaw’s family was in Auckland when WWI broke out. Her father had been 22 years in the army in India and went overseas with the NZ Army as a farrier sergeant. On his return he was balloted 11 acres in the Te Miro settlement and Mary and her family’s introduction to life in Cambridge was having to walk up Sanatorium hill, while the dray and horse carted up their belongings. At first they lived in tents and later had a house built. They lived on rabbits which the girls caught and skinned. Mary’s mother was a teacher in England and the girls had lessons at home before the school was built in 1920. Her mother also ran the first Post Office and went to the sanatorium or Lowe’s residence on Flume Road to get the mail. Then the Te Miro residents picked up their mail from the Bradshaws’ home. (Later Mrs Ada Keyte took over as post mistress.) Mary’s father took the local cream to the Hautapu factory twice a week and was then offered a job at the factory working the horse. They were six years at Te Miro when, like many others, they walked off. Rabbits were a big problem throughout the hills and Whitehall’s Rabbit Board ranged over 20,000 acres. (There were fourteen petitioners.) The special rates and government subsidy produced sufficient income to employ a permanent rabbiter and gangs at the appropriate season. Karapiro arranged a systematic destruction programme. Taotaoroa’s Rabbit Board, which included Whitehall, Buckland Road, Peria, Piarere, French Pass and Karapiro, came much later in 1941 with 97 petitioners. Blackberrying was a favourite pursuit in February and the Independent reported “Parties are to be seen in all directions plucking the luscious berries, which seem specially partial to the Waikato. The crop this year is particularly fine”. The highly bred Clydesdale stallion ‘Sir Wesley’ stood at W C Wallace’s ‘Thirdpart-ha’ Stud at Fencourt. He met mares by appointment for a fee of four guineas. In 1909 the local boys had joined half a million boys around the world to become Boy Scouts. At a meeting held in the St Andrew’s Schoolroom Master Ken Mullins proposed and Master Leslie Wilkinson seconded that a scout patrol be formed in Cambridge. By the 1920s they were flourishing and held a trek camp on the Maungakawa ranges. Their camping equipment was loaded onto a cart and the Independent reported, “Everything dear to the heart of a boy in the way of exploring, building camps, story telling by the camp fire, etc. was found in place in this delightful outing. Truly what boy that is a real boy would not be a boy scout these days.” In 1922 the boys were the first to place a wreath, with the words ANZAC in purple letters, on the cenotaph site. A Swimming Club had started in Cambridge at the end of the 1890s. First in a roped off area in the Waikato River, then at Te Koutu Lake, then in the Town Baths in 1912. In January 1920, a subcommittee of the club was formed to issue season tickets after approval, for mixed bathing to any lady and gentleman who made application. Mixed bathing was held on Wednesday evening between 7pm and 9pm at the Town Baths in Victoria Street situated where Sheffield Court is today. In Hamilton, sunbathing at the Hamilton Lake or anywhere in view of the general public was prohibited under a new Bylaw. Bathers were allowed to stay in their costumes while in the water and while going to and from the water. Anything in the nature of loitering about the shore in a swimming costume was forbidden and the police had instructions to take action. 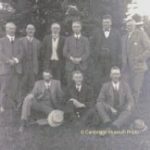 At the Golf Club’s annual meeting in 1920, Mr James Taylor, who was grazing the Defence Department Rifle Range property known as ‘The Hams’ at Karapiro, offered the Club the 130 acres if he surrendered his tender. The Club, however, decided they were not in the position to accept this most generous and desirable offer. (A letter to the Independent’s editor in June 1921 entitled Sunday Evils included, “I stumbled across one of our most respected residents wending his way in the direction of the golf links, fortified with a bag of those silly clubs”. The correspondent continues “What a miserable example a man like this is to our rising generation in Cambridge”.) Later at a special meeting called on 29 October 1923, Mr Mervyn Wells reported that the Defence Department property ‘The Hams’ could be secured for ten years at a rental of £20 a year plus rates approximately £5 a year. The members approved and they played on the new ground the next year. Mr Dave Lundon, the Club’s solicitor, then registered the club as an Incorporated Society. The clubhouse from Hamilton Road was shifted to the new property near the Borough boundary. It was later shifted to the site of the present clubhouse but burnt down in 1932. In 1924, Mrs Kate Peake (wife of John W Peake) of Cambridge became New Zealand Ladies Champion. In the 1930s golf courses sprung up around the district – ‘Wairakau’ on various properties in Horahora; ‘Fencourt’ on the Swaynes’ and Feissts’ property on Flume Road; ‘Bardowie’ on the racecourse and the ‘Buckland Road’ Golf Club on the Barrett farm. Later another club opened at the Karapiro Domain. The Cambridge Electric Power Board was formed in January 1920, after the government bought the Horahora power station – now submerged in Lake Karapiro. Horahora power station had been built privately by the Waihi Gold Mining company and by 1913 was supplying electricity to their operations at Waihi and Waikino. A concrete substation (the original rear part of the Power Board building in Empire Street and now a restaurant) was built in 1921. Another substation was built in Leamington on the corner of Shakespeare and Browning Streets. A large number of people gathered in the town hall for a demonstration on the uses of electricity. Messrs Turnbull & Jones were the local engineers and their demonstrator Miss Trent had scones, sausage rolls, shortbread and various kinds of cakes all piping hot from the oven. There was no smell, no dirt, no stoking of the fire and all present were suitably impressed with what they saw. Also exhibited were other household contrivances: an iron, vacuum cleaner, fan, water heater, etc. Leamington was the first district in the Waikato to benefit from this electricity and during a celebration on 29 April 1921 the Leamington Hall was “ceremoniously flooded with a magnificent light from nine powerful lamps”. Street lamps were suspended in the centre of the streets and turning on the street lighting on 1 April 1922 was a special moment for Peter Lewis, the six year old son of the Mayor Sam Lewis and Mrs Sarah Lewis. A few minutes after the hour of seven had chimed from the Post Office tower, Peter pressed the button and illuminated the streets and domain with the new power. The Independent newspaper reported that the crowd of over six hundred cheered and applauded lustily. The Power Board Building in Empire Street was built by Speight Pearce Nicoll Davys and joineryman, Jack Savory, in 1925. The architects were Edgecombe and White and the building cost £3,174 4s 6d. The Independent reported “While the outstanding feature of the general appearance is one of substance and utility, the style of architecture is distinctly pleasing to the eye. Inside all doors and joinery are of rimu, steel framed windows and white tiled sills, while all corners in the building are rounded.” Mrs Nancy Clark nee Oaten came to Cambridge with her parents, two sisters and a brother from Thames in 1921. Her father, Herbert Oaten, was an electrical engineer and worked for the Cambridge Electric Power Board. They lived in Empire Street next to the Power Board offices, their place backing onto Nick Hill’s auction mart. Her first school was the St Andrews Private School. Nancy remembers when they first got a wireless (radio) and townsfolk would stand at their gate to listen to the music. Her father put chairs for them on the front lawn but her mother was not amused. Herbert Oaten remained the Power Board’s engineer until his death in 1959. Arapuni Dam, further up the Waikato River, was built to supply the electrical needs of a greater area. On 4 June 1929, the generators were operating. A year later they were shut down as water started leaking into the powerhouse. Eighteen months on and Arapuni was up and running again. As the wireless became popular, Mr Hastie in Victoria Street attached a loudspeaker to his set and large numbers of people gathered outside his shop to listen to the music. With the price at £28 17s 6d Wilkinson & Co guaranteed reception from their wirelesses from Australian stations. In December 1920, sixteen townsmen met to form a Beautifying Society. With Sam Lewis as the first chairman these enthusiastic volunteers, with support from the businesses, took up the work that the Borough Council could not do. In 1922 the Borough Council appointed an Arboreal Committee to have control over the trees planted in the streets, beautifying the public gardens, remodelling the fountain, etc. Their budget was £150 for their first year’s work. The Borough Council decided that unattended motor cars must be parked at an angle of 45 degrees from the kerb and no car was to remain parked, except on the west side from the BNZ to the old bank chambers, for more than ten minutes. A new bylaw enforced a speed limit on motor vehicles of 15 miles per hour in Victoria Street, 10 mph over Victoria Bridge, 8 mph around corners and 20 mph for the rest of the borough. Motorist still had to pull off the road at the insistence of a person in charge of a horse, to let the horse continue. Wilkinson & Co advertised the new 1921 Ford for £316. The car had an electric self-starter, electric lights, electric horn, detachable rims, spare tyre, rain vision windscreen and a hood operable by one man. E S Cross of Hamilton opened a branch of his Motor Painting business in Corpes Garage in Victoria Street, with G N Reid as manager. In 1920, The Triangle was completed on the corner of Victoria and Empire Streets. One of the ground floor shops was a stationer and book shop run by Mr David Congalton and on the corner was Alfred Boyce’s jewellers shop. The top floor tea rooms provided light luncheons with a ladies cloak and restroom. The Murphy Buildings (corner of Victoria and Alpha Streets opposite the National Hotel) were auctioned. Lot 1, the triangle went for £370, Lot 2 on Victoria Street went for £870, Lot 3 £870, Lot 4 went to E J Easter for £905 and Lot 5 on Alpha Street went for £121. Lot 6 was on Empire Street with a 5 room house and went to the Electric Power Board for £700. On the opposite side of Victoria Street in 1923 the Bank of New South Wales erected a new brick two-storey building with the assistant manager Mr J Mahony living upstairs. The Bank of New South Wales had been in Cambridge since 1901 when it purchased the former Colonial Bank buildings from James Hally. It was 1st and 2nd March 1921, the two days of the Cambridge Show, when the large crowd enticed Messrs Walsh Bros’ Arvo aeroplane to make a landing. They chose the polo grounds at James Taylor’s (on the Hautapu side of the race course) and 82 Cambridge people took the opportunity for £2 10s each to accompany Captain Upham in the first aeroplane flights from Cambridge. Captain Upham also gave an exhibition of fancy stunts and his nose dives, looping the loop and corkscrews had the breathless attention of practically everyone in Cambridge. The foundations of the Cambridge Harness Racing Club were laid at a meeting in October 1919 and the inaugural meeting of the Cambridge Trotting Club on 15 January 1921. The first race meeting was in February 1921 with the first totalisator meeting on 9 May 1925. The meetings were on the showground and in 1925 the Trotting Club took over the lease of the course and buildings from the Waikato Central Agricultural Association. By 1926 they had built a new official stand, stalls for 105 horses, women’s rest rooms, men’s toilets, bar accommodation, additions to the totalisator and a new birdcage. The next year the turnover for their race meeting was £17,466, the largest for any one day trotting club in the province. The Waikato Hunt Club’s meeting on Labour Day drew a crowd of 12,000 people and a turnover of £42,000. June 1921 the Independent reported -“The flourishing little country district of Kaipaki was en fete, the occasion being the opening of a new school.” There had been a school at Pukerimu since 1876 which, the Hon. John Fisher related, the settlers had built themselves from pit-sawn kahikatea on donated land. The Hon. C J Parr Minister for Health and Education (and former pupil of the Pukerimu school) opened the new school. Ina Speake nee Christiansen came to Kaipaki in 1927 with her parents, brother and three sisters, when she was 15 years old. Ina worked on the family farm and felt the depression didn’t make much impact because they were poor to start with. In 1950 Ina married Cyril Speake and moved down the road where she spent her time raising her own family. Her first memory is when she was three and three quarter years old. Her mother was expecting a baby and Ina’s grandmother came to collect her and siblings. Ina was upset and wouldn’t eat her tea, but when left alone she was so hungry she ate the bedside candle. In 1922, the Pukekura Road Board, which had been operating since 1878, was absorbed into the Waipa County. Pukekura objected to the Prime Minister. They wanted to stand alone, but they could not get past Section 30 of the Counties Act 1920 which gave Counties the power to merge Road Boards “without consent of the Boards or the ratepayer”. Waipa County argued that the whole of the Waipa road rates would be available for road works and the only loan Pukekura would have was for maintenance of the Victoria Bridge. They also insisted that trade would not be taken away from Cambridge. Pukekura members had been prompted to object to the merger by “the horror of previous incompetent road works” but again Waipa insisted “things were vastly different now”. The Pukekura Road Board ceased to exist on 31 March 1922. The next day Nurse Russel was continuing her work through the generosity of Mr H W Smale on Thornton Road, as he set aside a portion of his house to accommodate five or six patients. Cambridge citizens, led by E J Souter, raised £1,200 for a new nursing home and the first floor was rebuilt by C W Cooper in 1926 from plans by James T Douce, for £1,920. Nurse Russel and then Nurse Dickey ran the home, which later became known as Whitiora, and run by Sisters McConachie and Pettigrew. In 1934 the second storey was added to the hospital by Speight Pearce Nicoll & Davys. When the ‘new’ maternity hospital was built in 1962, Whitiora became a geriatric hospital, then boarding house and flats. In 1974, the Penmarric restaurant was born there and became well known for its Devonshire teas, then lunches, and by the 1980s it had become a top Waikato restaurant. Girl Peace Scouts started in Cambridge 3 September 1921 through the enthusiasm of Pat Levesque. The girls’ first mission (under the guidance of Gwladys Perkins) was to climb to the trig on Pukekura. Not long after, Miss Claire Richards and Miss Dorothy Bellamy became their joint Scoutmistresses and the first 15 girls enrolled as Girl Peace Scouts on 30 October 1922 in the YMCA rooms. They made their own uniforms – khaki drill dresses with four pockets, nearly to their ankles and belted at the waist, black woollen stockings and black shoes. They wore a khaki lemon squeezer hat like the boy scouts. Their badge was the same shape as today’s Girl Guides but with the letters G P S.
Very little of their time was spent in the clubrooms on a Saturday afternoon. They did first aid and stretcher drills, marching, stalking and tracking in the domain and signalling in morse code across Carters Flat. They had a very keen band of mother helpers who in the first year raised £25 for the girls to attend their first camp. In October 1924, forty Girl Scouts enrolled as Girl Guides, a bigger movement which stood for bigger things. Their first public appearance as Girl Guides was at the Anzac Parade in April 1925. Their navy blue dress was now 4 inches above their knee and belts worn around their hips. Their tie was gold with two dark green diagonal stripes and a wide brimmed hat of blue felt. In February 1928 Brownies started, and by 1929 the older Guides were ready for their first Rangers meeting. They were called the Robinhood Rangers and carried the Girl Guide promise “To do a Good Deed Every Day” out into the wider community. One of their services was to embroider bedspreads for the new Campbell Johnstone ward at the Waikato Hospital and to visit the sick children. In 1931, Lieutenant Jessie Anderson of the Cambridge Girl Guides was the second New Zealander to receive the Ranger Gold Cord for special efficiency in Guide work. Lieutenant Anderson was also privileged to be Lady Baden-Powell’s Standard Bearer when she attended the Scouts and Guides Rally in Auckland. In 1926 a local hairdresser, Eddie Buttimore did the first permanent wave in Cambridge with a Eugene Perming machine. A local minister the Rev J D McArthur, in the course of his Sunday sermon, referred to the decadence of music and literature. Jazz with its ranting music and clashing of cymbals, attracted people in their hundreds. Trashy novels were eagerly sort after in libraries. Literary and Debating societies only attracted an audience with a light humorous programme. The minister believed that this deplorable state of affairs was largely caused by our much vaunted system of secular education. People were growing up without regard for religious things and a disregard for the better and more lasting things in life. The War Memorial, which cost £2,000, recorded 74 men who were killed in WWI and was erected in 1923. The architect of the Memorial was Nigel Walnutt and he put the Italian marble statue (the Cambridge Soldier), plinth and lion in the middle of a cross. The sculptor was Richard Gross whose great desire to give something worthy without consideration of cost to himself in labour or expenditure, made it possible to erect one of the most poignant memorials in New Zealand. The contractors were A & T Burt of Auckland. Subsequently 77 men from WWII, and a memorial plaque for the South Africa, Korea, Malaya, Borneo and Vietnam wars have been added to the memorial. In 1923 complaints were made about the water supply and after tests it was found the Moon Creek supply was contaminated and a danger to human health. Council initiated a loan for £37,000 for a new supply using the springs from Maungatautari and a reservoir at Pukekura. This was opened in 1927. The Fire Brigade was kept pretty busy when on 1 July 1926 the Farmers Auctioneering Co in Duke Street went up in a spectacular blaze. Thanks to a brick dividing wall and the heroic efforts of fire fighters, the Central Hotel was saved although badly scorched and water damaged. The Farmers building was originally built in 1870 and enlarged in 1879 when Thomas Wells bought the store from James Hally. Thomas Wells was a well known ‘universal provider’ until his death in 1910 when the firm passed to his son Mervyn. Farmers had bought the Wells’s out in 1920 – six years to the day of the fire. Then on Saturday, 3 July the fire bell sounded again and the Central Hotel also went up in smoke. It was not such a brilliant spectacle as the Farmers fire and dense smoke covered the whole street making the firemen’s work more difficult. The building had already been soaked with water during the Farmers fire and after a two hour struggle the brigade had the fire under control – but the top storey was gone and the building ruined. The Central was formerly the Criterion Hotel and Empire Street was Brewery Street when a large brewery run by the Hally brothers from 1872 flourished where the Webb Trust block of buildings is now. The old Criterion Hotel was built by Madigan and Miller in 1877 for the licensee Edward Hewitt. The name changed to the Central Hotel in 1908 and today’s building was erected from plans by James T Douce. A feature of the building was the cast iron balustrade to the cantilever balcony and the entrance on the corner of Duke and Empire Streets. Nineteen bedrooms were upstairs and three lock-up shops, public and private bars and dining room downstairs. It was all converted into shops and offices in 1977 after being auctioned off when the Dominion Breweries licence went to the Cambridge Tavern in Leamington. Building progressed as Calverts Chambers, Gascoigne and Willis’ legal chambers and a new office for the Independent newspaper were all erected in 1926. Speight Pearce Nicoll and Davys extended the Presbyterian church to accommodate a further 100 parishioners and added a porch with turrets on the Victoria Street entrance. There had been a Presbyterian church in Cambridge since 1872 when the Manse was in Wilson Street – the oldest Presbyterian Church in the Waikato. The first church built in 1878 on the Whitaker Street site, was soon bursting at the seams. In 1898 the Presbyterians built another church, very typical of the late Victorian era when New Zealand copied English Gothic stone churches, but in wood. It was built of kauri and rimu by J Lye & Sons from the architectural designs of Mr E Bartley for the sum of £813 6/11d. It was the first public building in the district to be illuminated by acetylene gas. The original church was moved along Victoria Street, renamed the Victoria Hall and used as the Sunday School. This was sold and removed in 1921 when the Peace Memorial Hall was built in memory of the soldiers who fought in WWI. The Presbyterians and Methodists united as Trinity St Pauls Union Church in 1975 after an arsonist burnt down the Methodist church. The old Presbyterian church was sold and is now (2017) run as a bar and restaurant. The School Dental Service began in New Zealand in 1921 when 35 probationer nurses undertook two years training in Wellington. In Cambridge the Primary school clinic was built in 1927. The High School department moved to the corner of Clare and Grey Streets in 1927-1928. The Cambridge Intermediate School was established there in 1963 when the present High School moved to Swaynes Road. Arbor Days throughout the 1950s and 60s saw the planting of many trees and shrubs around the Clare Street grounds and of special note are the Wych Elms. On 6 December 1927, the corner of Duke and Victoria Streets was destroyed by fire. Nine shops, including Farmers Trading, were demolished and others seriously damaged. On this site, the Veale Buildings, consisting of seven shops, were built for £4,600 by SPND from plans by architect James T Douce. C F Ruge built for £1,350 and Mrs P J Turney (on the opposite side of the street) for £1,150. Further down Duke Street, the Cambridge Dairy Co built new offices for £1,750. The present day (2017) tapas bar was also built in 1928 and still has an intricate patterned pressed zinc ceiling on the verandah. Fire destroyed another three wooden buildings to the north of Calverts in Victoria Street in 1929 and later that year four new shops were put up in their place. In Queen Street, the private Midlands Hotel designed by architect Archibald McDonald, was built in 1928 for £5,185 – the contractor W G Clague. This impressive building has seen days as a boarding house, Hall of Residence for the University, flats and a Bed and Breakfast. The end of the decade went out with a boom as talkies arrived at the local picture theatre on 12 October 1929. The Broadway Melody appeared for five nights in the Town Hall and was advertised as Metro-Goldwyn-Meyer’s Sensational Dramatic Production, All Talking All Singing All Dancing.